A large island with bumpy terrain and dense vegetation describes Fitzroy Island National Park. The island is still considered as a virgin island as many of its corners are still unexplored. The island is covered with mangroves, tropical rainforest and coral beaches where you can walk around, coral reef and wonderful marine life. Ideal for a day trip from Cairns city center! Camping grounds for night stay are available. Camping grounds has showers, toilets, BBQ facilities and picnic tables. The rooms of the resorts have features like, king/queen size bed, cots, television, bar fridge, Alarm clock, daily room service, air conditioned, hairdryer, tea/ coffee making machine and elevator. How popular is Fitzroy Island National Park? People normally club together Paronella Park and Davies Creek National Park while planning their visit to Fitzroy Island National Park. People also prefer to end their day with Fitzroy Island National Park. 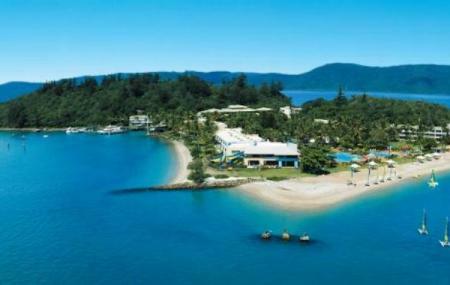 Great island to be explored and close to cairns. It takes you about 50 min to get over by speed boat. You can snorkel and hike and the island has quite of a variety of Flora and fauna. Walk up to the light house is very steep and slippery when wet. As an island, it's lovely. The resort is tired - don't be fooled by the supposed 4.5 stars. More like 3. Wonderful place for day trip. Beautiful 45 minute ferry ride to island. Great for snorkelling if your lucky you will see sea turtles. Few good walks to do The secret garden, the Light house and Muddy beach. Fitzroy island snorkling was great. Foxys bar and grill was a miss. Food terrible. Shop served melted and refrozen ice cream. Don't get food there either. Take a picnic lunch.